One of my favorite episodes of Avatar: The Last Airbender is “The Ember Island Players.” It has the show’s band of heroes attending a play based on their adventures. A bunch of great jokes are made at the expense of the awful play, a caricature of the series itself that the writers exploit for some self-referential humor they are otherwise unable to indulge in. The Legend Of Korra game, a Platinum Games-developed tie-in with The Last Airbender’s sequel series, is reminiscent of the Ember Island Players—not the episode, but the play. The terrible, terrible play. It seemed a “you got peanut butter in my chocolate” style match had been made when it was announced that Platinum would be developing the Korra game. The studio is known for making energetic over-the-top action games, a perfect fit for the series’ meticulously choreographed fight scenes. The reality, though, betrays both sides of this pairing, failing to live up to Platinum’s legacy of exciting, frenetic action and ignoring or misunderstanding everything that makes the television show great. The game finds Korra between seasons two and three, a transitional period for the show—right after she opened up the gateway between the spirit and human worlds—that is ripe for a good story. Instead of using it, though, the game presents a hackneyed storyline that would be funny if it were played with even the tiniest bit of self-awareness. The villain is a maniacal old man who wants to steal Korra’s avatar powers for unclear reasons, a goal that seems out of place in Korra’s established mythology and at odds with the the series’ typically complex antagonists. What’s worse, the game jettisons the ensemble-cast dynamic that is one of the show’s core tenets. In a moment symbolic of this disregard for the source material’s aptitudes, the male leads, Mako and Bolin, are knocked out of the ring during a pro-bending match—a wrestling-style competition for those who can wield (“bend”) the elements—and never return. The fourth member of the show’s team, Asami, never shows up at all. The only supporting character, in fact, is Jinora, granddaughter of Aang (Last Airbender’s kid hero) who occasionally contacts Korra via astral projection to give advice on behalf of the game developers. Platinum’s approach to the Avatar universe feels flimsy, like a caricature of the show’s detailed world. Familiar settings appear, but they’re empty—a city with no pedestrians, a temple with no monks—stripped of life and made into bland combat arenas. The only bright point here is Korra’s voice, Janet Varney, who reprises her role and does her best with the material. With dull writing and no supporting characters, however, her voice-over can only do so much, leaving even the typically charismatic hero a bore. All of this would be forgivable if the combat were as fun and fluid as Platinum’s pedigree might suggest, but that, too, is a caricature, a bad imitation of a Platinum great, like Bayonetta. The structure is similar: chaining strikes into long combinations with high-damage counter-attacks and those “mash the button pictured on screen” events. The special twist for Korra is that players can switch between the hero’s elemental powers on the fly. They largely operate the way you’d expect: Slinging fire is great for destructive brawls. Manipulating earth is slow but powerful. Water-bending proves effective at long range, and air is handy for crowd control. But there’s an elegance in the brawling of superior Platinum games, like Bayonetta and Metal Gear Rising: Revengeance, that is absent here. Korra’s moves are rigid and slow, and some of her maneuvers feel useless, like the strong water attack, which I never figured out how to reliably get to even hit enemies. There’s also a simple system for upgrading Korra and her moves, but the growth never satisfies. 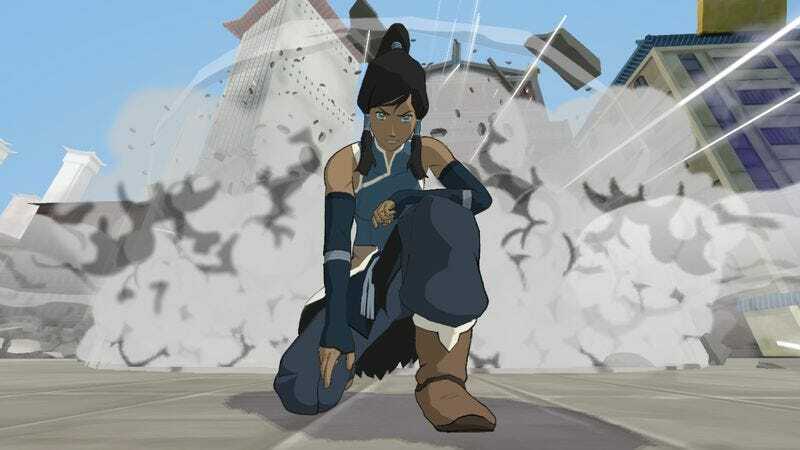 It struggles to be more than a shallow button-mashing outing, Korra clumsily lashing out at enemies and peppering in the occasional counter until the fight is over and she can move on. The game goes so far as to sabotage its own fighting system in a misguided attempt to create that inadequate character progression. Korra’s elemental bending abilities are locked away early on, forcing players to rely on limited close-range attacks for the opening level before the game slowly metes out her abilities over the next few chapters. When fully formed, the bending system allows for some creativity in combat that is the game’s sole joy. As such, the proceedings pick up some steam as they head into the finale. The final boss fight is a high point, a fair enemy with interesting moves (a massive divergence from the game’s parade of bland mooks and monsters), and by that point, Korra is at the height of her power. For a brief moment, she feels like the Korra of the show—a master of elements and martial force of nature. But it’s too little, too late. The value of an episode like “The Ember Island Players” is that it lets the writers have their cake and eat it, too. They get to acknowledge their flaws and failures while simultaneously complimenting themselves, holding up a miserable self-parody as proof that things could be much, much worse. The Legend Of Korra game is the “much, much worse” scenario, and the kindest thing to say about it is that it serves a similar function to the anemic stage performance in “The Ember Island Players.” Through sheer inferiority, it’s a reminder of what makes both the series it’s based on and the games it imitates so beloved.